People sometimes ask me why they should use Westchester Morgtage instead of one of the big banks. It’s a fair question, with an answer that goes beyond great service. The lending industry bases their approval decisions on the following three criteria. Banks tend to take a conservative approach but mortgage brokers have more flexibility to offer their clients. 1. Credit score. Are you paying your bills on time? Have you defaulted on a credit card or fallen behind on your car payment? The bank will determine the risk of lending you money based on your previous bill-paying history. 2. Income. The bank will take a look at your income and assess your ability to repay both your existing debts and your future expenses. You’ll need to earn enough for them to feel confident in your ability to pay all your expenses while comfortably paying your mortgage premium each month. 3. Equity. This is your collateral available to secure the mortgage. The bank will offer you better rates when you pay a higher amount on your downpayment. If the bank feels your credit history, income or equity are questionable, they will decline your mortgage application. So now what? Here’s where an experienced mortgage professional can get a “yes” when the banks say “no.” First, I will get your paperwork and documentation organized up front. If you are divorced or in the process of divorcing, it is critical to show the divorce decree or separation document. My job is to understand all your income sources and represent them properly for the underwriter. I also look for additional income. Alimony, child support and bonus income are sometimes left off the application and could very well be the difference between the approval or denial of the mortgage. I dig much deeper than the banks for my clients. If you want the best chance to be approved for a mortgage, starting with Westchester Mortgage is the best path to take. Do you know someone who is thinking about using a bank for their mortgage? Please have them call me so I can help them gain every advantage in securing a mortgage approval. That is one grimy keyboard. Grab your silly putty and alcohol. When was the last time you took a good long look at your computer keyboard? If you haven’t cleaned it in a while you may have noticed anything from dust and crumbs between the keys and dirt and grime smudged on the keypads and spacebar. Pretty gross. 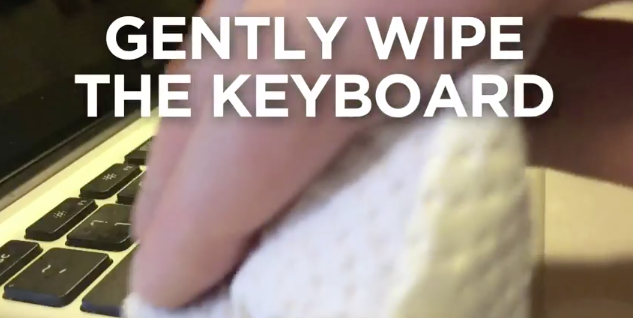 Now before your inner germaphobe starts freaking out about the bacteria you’ve been dabbing onto your fingers with every word you type, there is a fast and easy solution to cleaning up your keyboard without a lot of effort. 1: Silly putty. Remember this stuff? If you’re over 35 or so, you may have used silly putty to pull up cartoon images from newspaper ink when you were a kid. Silly putty can also pick up those pretzel crumbs, pet hair and lint that may have found their way into your keyboard. Just press on some silly putty and all that garbage that’s been hiding between those hard-to-reach nooks and crannies around the keys will be lifted right up into the putty. Awesome! But what about the grimy keypads? 2: Rubbing alcohol. Pour a small amount of alcohol onto a paper towel or cloth. Next, gently rub the alcohol into the keypads until they start to sparkle. Important: Do not use water. Water has a way of ruining keyboards. Instead, use rubbing alcohol. It dries quickly and won’t short circuit your keyboard. Here’s a video link. Click the image below. The result should be a keyboard that looks brand new. Enjoy!